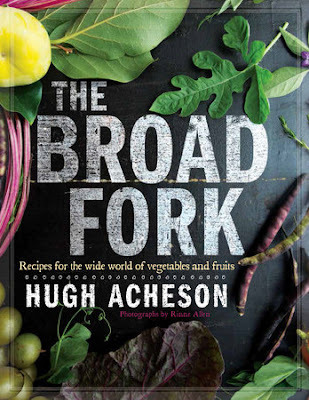 I have been eyeballing the new cookbook, The Broad Fork, from chef (and Top Chef judge) Hugh Acheson for some time. Southern cooking is booming these days, and Acheson certainly is the expert in presenting it with all the flourishes of his French training tempered by the comforts of okra, gumbo, black-eyed peas, and grits. However, don't expect to see tired (although tried and true) recipes. No, no. 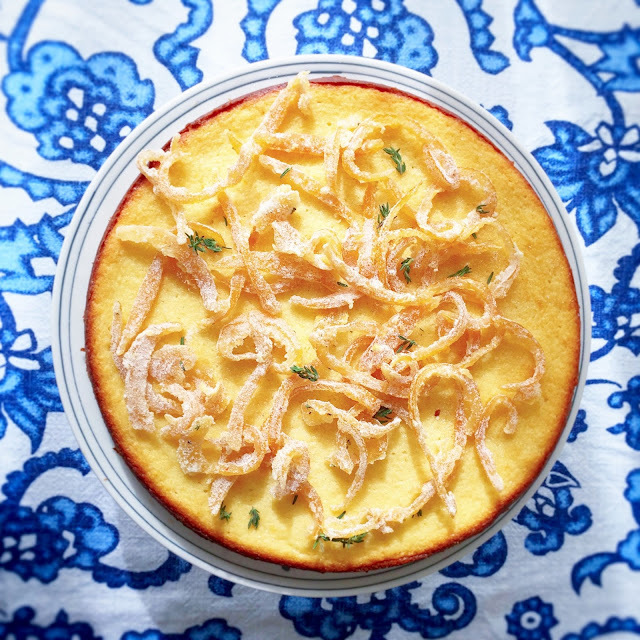 Acheson punches up his grits to become "Crisped Pork Belly with Kimchi Rice Grits and Radishes" and his black-eyed peas transform into "Crisp Flounder with Field Pea Ragout and Herb Salad." This is a foodie's cookbook with a lot of Southern zing. Acheson asserts that he wanted to write this cookbook because he is a strong proponent of CSA subscription and farmers' market attendance. However, often people don't know what to do with the inevitable mounds of sunchokes or kohlrabi or salsify that show up in the CSA box. (In fact, he opens the book with his neighbor who asked, "What the hell do I do with kohlrabi?") For a year, Acheson took the ingredients from his CSA box, developed four recipes for each star veggie or fruit, and we're all the richer because of his efforts. Now there are no more excuses when the unfamiliar veggie shows up in the farmers' market stalls, and Acheson also promises that you can do fancy things with your carrots, cauliflower, onions, and radishes. Roasting the tomatoes for the dressing. With hardly a dessert in sight (in fact, the book boasts only three, one of which is "Persimmon 'Pop Tarts'" and thus seems less like a dessert and more a healthier alternative to industrialized breakfast fare), this book focuses on savory, refined dishes often with some pricey ingredients (veal cheeks, crab, and lobster come to mind). However, Acheson provides recipes for larder items (such as "Fig Vinegar" and "Vidalia Onion Marmalade") and some more basic and budget friendly weeknight fare ("Radish and Cucumber Sandwiches" and "Fried Brussels Sprouts with Lime Vinaigrette"). I thought I was choosing a more weeknight dish with this recipe "Tomato Salad with Crisped Farro, Purslane, Arugula, and Roasted Tomato-Miso Vinaigrette." And indeed, besides the crisped farro, everything about this recipe is geared toward a quick summertime supper or side. Certainly, one must roast the tomatoes for the dressing, but everything whipped up in a snap. That is, except the farro. And even the farro is relatively simple--it just takes a tad bit of patience. The cooked farro is easy enough to do the night before as a sidedish to, say, a pork dish (and then save the leftovers) or to do while the tomato is roasting for the dressing. It's the crisping of the farro that leaves me entirely out of the loop because it requires attention to detail while you ensure that neither the oil nor the farro itself is burning and a willingness to patiently wait so that the farro gets crisp (okay, only about a minute). I'll admit: the husband crisped the farro for me. I know my limits. 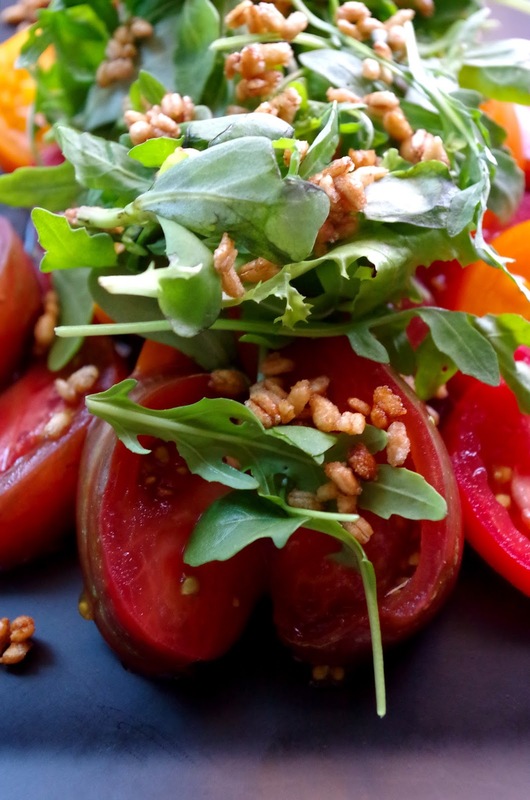 The farro brings a nutty crunchiness that is a pleasant contrast to the juicy, bright tomatoes and the bitter arugula. And if you really, really didn't want to crisp the farro you could throw a handful of sunflower seeds or toasted pinenuts on top, but I promise you that you will be missing out. And the purslane. Oh my. I, like most North Americans, don't generally use purslane in my cooking; however, the Europeans, North Africans, and Middle Easterners are onto something here. While North Americans often banish purslane (or little hogweed) to the weeds category, perhaps we should reconsider. Its salty sourness is similar to that of watercress but without the bite. It added complexity and depth to an already interesting salad. Indeed, Acheson delivers on his Southern fare (even if this particular salad doesn't seem decidedly so), and I cannot wait to get my hands on some of the other recipes in this foodie-friendly book. I think, though, I am going to wait until it's time for more fancy dining. 2. To make the dressing: Core the 1 large heirloom tomato and cut into thick rounds. Season the rounds with salt and pepper, and arrange them on a parchment-lined baking sheet. Roast in the oven for 30 minutes, or until the tomato slices are very soft. Remove the tomatoes from the oven and let them cool to room temperature. 3. When the tomatoes have cooled, place them in a blender and add thyme, miso, soy sauce, and vinegar. Puree until smooth. Then with the motor running, slowly add the olive oil. The recipe makes about 1 1/2 cups (and you need only 1/2 cup for the salad). The other cup will keep for a week in a jar in the refrigerator. 4. To make the salad: Bring 2 cups of water to boil in a saucepan and add 1/2 tsp of kosher salt and the farro. Lower the heat to a simmer and cook the farro until tender, about 25-30 minutes. Strain the farro of any excess water and then spread it out on a large platter or baking sheet lined with paper towels to get the farro as dry as possible. 5. In a large saucepan, heat the peanut oil to 350 degrees. Add the farro in batches and fry until crisp (about 1 to 1 1/2 minutes). While you want the farro to be crisp, you don't want it to be hardened. Remove from the oil and drain on the platter, lined with fresh paper towels. Season with salt and pepper to taste. 6. Arrange the sliced tomatoes on a large platter and season them with salt and pepper. Drizzle 1/4 cup of the vinaigrette over the tomatoes. In a large bowl, combine the purslane and the arugula and dress them with another 1/4 cup of the vinaigrette. Place the dressed greens in the center of the platter atop the dressed tomatoes. Garnish with the crisped farro and season with fresh black pepper.